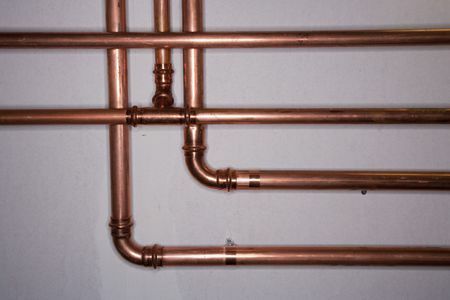 Copper is one of the most preferred materials used for water pipes. Let’s find out why. 1.Health implications- Copper water pipes are completely impermeable, preventing any outside chemicals such as insecticides and fertilizers used on yards or petroleum products spilled somewhere, from polluting the water system. The same cannot be said about plastic pipes. Recent studies indicate that plastic pipes may leach chemicals, affecting the taste and odor of the water, which are difficult to identify. And above all of that, there is almost negligible information on how these chemicals may affect human health. When used for underground installations, plastic pipes have been known to allow petroleum products, organics, pesticides and other contaminants to pass through the wall of the pipes and into the water. On the other hand, copper is an important micronutrient for the existence of human life. In addition to providing with dietary copper, it also kills microbes and prevents chemicals from leaching into the water. 2.Material costs- Public installations such as water pipes are a major investment and are to be borne keeping in mind the service they’d be providing for decades to come. One bad decision in the present could result in dug up streets and lawns disrupted water service and customer lives. When choosing a material, it is important to keep the full life-cycle costs which can be expected over the service life and also the salvage value at the end of the service life. The use of copper in water pipes started in the 1930s and is known to offer a 75-100 year lifetime of use. Copper does not corrode like iron and stays put in most underground environment. The superior strength along with the malleable and durable nature of the metal allows it to withstand high pressures and a wide multitude of temperatures without cracking, leaking and rupturing. Meanwhile, plastic pipes have a total lifespan of 25 years approximately. With plastic, there is an above average risk of premature failure as a result of oxidative degradation due to the reaction caused between chlorinated water and the pipe itself. When compared, the copper pipeline needs to be changed after a span of 75-100 years. While a plastic system needs to be reinstalled just after 25 years or so. Furthermore, the copper pipes could easily be sold for scrap at the end of its life span for 80-90% of the value of new copper. 3.Environmental impacts- When it is time to replace the line, copper can easily be recycled to form any other product with losing any of its beneficial properties. Its long life cycle, coupled with easy recyclability without affecting the purity and quality of the metal makes copper a highly sustainable piping material.